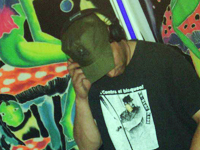 DJ Ali.3n started spinning the decks in Hamburg in the year 1995, after being infected by the psyvirus in the early nineties. There he played at numerous underground parties and after a while he became a DJ in demand at many big events. In 2000 he changed his base to Munich, where he and P.Schock, his buddy for many years, launched the nowadays well-known label Spontaneous Aerobics. The two music addicted freaks started playing back2back sets as the Psyrobics DJ Team and rocked the floors in many countries. Next to that both are organising parties as the "Psycoresqatters" in the southern psy-area. For his floorkicking twilight sets, Ali.3n prefers twisted Full-On, as well as intelligent Darkpsy, everything mixed up in an extraordinary way. Psychedelic is his keyword so you know what you will get. It's also possible to book him for a mind-expanding Chill-Out set.